In her Wolfgang Iser Lecture 2013 literary theorist Linda Hutcheon applied Iser’s concept of reader response to the particular kind of professional reader known as the reviewer, examining different types of reviewing in the digital age and demonstrating that the dialog between text and reader continues with the review’s own response-ability. 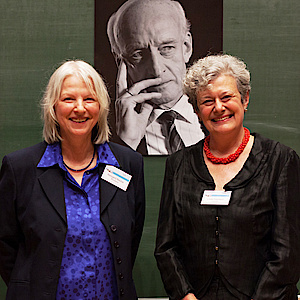 The 2013 Wolfgang Iser Lecture took place as the opening event of the Anglistentag, the annual convention of the Anglistenverband, the German society for scholars of English language and literatures. Hutcheon began her lecture with a personal reflection on the “trauma” of how a graduate course with Wolfgang Iser at the University of Toronto in 1974 led her to “re-write [her] entire dissertation” in comparative literature, due to the key realization that she had somehow managed to ignore the role of the reader and the act of reading in her study of self-reflexive fiction. You cannot ignore the reader or the act of reading, the process of making sense of what we read. There can be more to literary study than the interpretation of individual texts, a realization that led her to become a theorist, interested not only in the specific meanings of texts, but how texts mean and how readers contribute to that production of meaning. Taking these key lessons from reader response theory as a starting point, Hutcheon went on to consider the role of readers today, when digital technologies have changed the ways we read as well as who reads. The current lamentation over the “lost art” of reading (which Kathleen Fitzpatrick in her Anxiety of Obsolescence has shown sets aside a kind of cultural preserve for the novel as a “high” art form) is neither new nor accurate, as similar disparaging comments can be found in the mid-nineteenth century and a different mode of reading does not mean the “death” of reading. What Hutcheon focused on in her lecture is the way the internet’s participatory cultures have led to new kinds of interaction around reading, particularly with regard to the specialist reader known as the reviewer. Historically a category of reader that arose in the 18th century, the reviewer aimed to explain the text to an emerging mass audience, a development linked to an increased readership for books in general as well as to changes in address from the particular reader to a broader audience. The book reviewer began to serve as a “consumer reporter,” not only recording his reactions to the book, but for particular purposes. The reviewer as a professional reader mediates between literature and other readers in order to educate the public on how to read, to harness their purchasing power in deciding what to read, as well as a range of other functions. What is new in this digital age is not the reviewer’s desire to influence the reading public’s perceptions or purchases, but a shift from the professional reviewer to the amateur and often anonymous reader who reviews books on personal blogs or in the comments on Amazon. While the historical reviewer’s opinions of a given book counted because of his reputation, today’s online reviews are frequently written by unknown, even unnamed readers “like us.” These supposedly democratic, but also “easily digestible” reviews – in the form of stars or similar rating systems – speak to a current taste for quick information, as opposed to lengthy, presumably more discriminating professional reviews. As newspapers close their reviewing departments, they do so not only with an eye to saving money, but with the justification that readers actually prefer the reviews of other readers like themselves to the trained reviewers of the past. Hutcheon observed that such a disappearance will be greeted in different ways because of the widely different functions such reviewers have filled, whether ideologically liberal, praising the avant-garde, or conservative, as guardians of existing values. Because of the sheer numbers of readers now reviewing books online, the variety of books so reviewed has increased, with bloggers independent of publishers’ marketing departments often seeking to promote works outside of a traditional canon. Similarly, the professional critic’s claim to be the arbiter of taste is undermined by the recognition, with Bourdieu, that though taste appears to be natural, it is in fact anything but. Anonymous and amateur readers from backgrounds like our own may share our taste much more closely than professionals, if only we knew which of our fellow readers to trust. Hutcheon’s conclusion connected the responsibility of reviewers to use their power to sway readers’ opinions ethically, guiding them in questions of morality as well as taste, to the response-ability of those reviews. The title of Hutcheon’s talk, “From Reader Response to Reader Response-Ability,” builds upon Bakhtin’s idea of how a text invites or presupposes a response, a concept that has been variously translated as “addressivity” or “response-ability.” While Bakhtin sees all texts as inviting a response – much as Iser sees the reader’s role implied in the text – Hutcheon claims that reviews, themselves responses to a text, in turn lead to further responses by their audiences. “The review-as-rejoinder can interpret, comment upon, evaluate; it can refute, agree with or support”; it is “a recorded reader response,” but it may also provoke a response from the author of the book originally reviewed, or indeed by its other readers. Its verdict enters into readers’ “horizon of expectation,” as Wolfgang Iser and Hans Robert Jauß described it, contributing to their own interpretations of the text. An awareness of the conditions under which a review is written is a necessary prerequisite to interpreting it and the text it reviews and one that has become even more prominent in this age of widespread and non-professional reviewing – this, then, is the responsibility of readers to consider the contexts of what they read. Linda Hutcheon’s criticism is very much informed by an awareness of herself as a reader – the critic’s interpretation of a text is first and foremost a reading – and this self-reflexivity is a direct result of her confrontation with Wolfgang Iser and reader response theory. What her own reading does to this theory is to remind us of the medial contexts in which reading takes place, whether we read alone or discuss what we read with others, whether we do so off- or online. She also expands the dialog from one between a text and an implied reader to a wider conversation between text, reader/reviewer, author, and numerous other readers. Emily Petermann is assistant professor in American Literature at the University of Konstanz. Prof. Dr. Linda Hutcheon (Toronto) ist eine der international bekanntesten Literatur- und KulturwissenschaftlerInnen. Sie wurde in den 1980er Jahren unter anderem durch bahnbrechende Werke zum Postmodernismus bekannt, sowohl in Kanada wie auch weltweit.